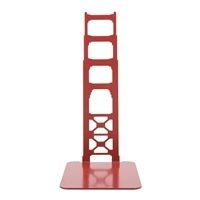 Turn your bookshelf into a work of art with this stylish pair of Golden Gate Bridge Bookends. Add a contemporary touch to your home or office with these dramatic metal bookends. Inspired by the soaring Art Deco towers of the Golden Gate Bridge, each bookend is cast from durable steel and hand-painted International Orange. Soft stickers on each base prevent slipping and scratching. Sold as set of two bookends. Give this unique gift a shake and watch the fog flow up and over the iconic Golden Gate Bridge, wrapping it in a misty, billowing embrace. Our Golden Gate Bridge Fog Globe makes the perfect keepsake to remember your San Francisco adventure! Shipped in a gift box with custom molded packaging inside for protection. 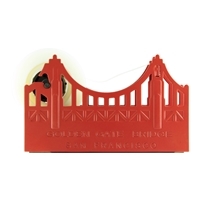 Made from 100% Recycled Milk Jugs, Our Golden Gate Bridge model car makes the perfect eco-friendly gift for your kids, or anyone that is a child at heart! The color is printed with Soy Ink, and it is completely free of BPA, Phthalates, and PVC.